The third and final installment of the dystopian young adult series “Maze Runner” overcomes the poor pacing and terrible writing of “The Scorch Trials” to deliver an exciting, dramatic finale. The “Maze Runner” adaptations have had mismatched quality. The first film was exciting at times but overly slow at others, and the second film was boring. But “The Death Cure,” the last of the trilogy, offers better pacing, dialogue and character development. The film follows Thomas, played by Dylan O’Brien, a young, charismatic leader in a resistance group fighting a science-fueled government looking to cure a plague by any means necessary. That includes enslaving and killing immune children and young adults in hopes of discovering some enzyme or something. It was never made very clear. 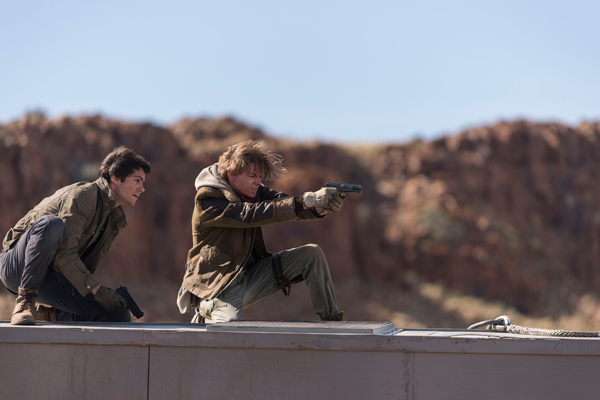 Where the exposition in “The Scorch Trials” felt clunky and forced, it’s more organic in “The Death Cure” and works into the dialogue without disrupting the rest of the film. Unlike the majority of action flicks, which seem to be plagued by plot-stopping, tension relieving humor in all the wrong places, “The Death Cure” does not rely on one liners or silly moments where the music halts and the plot stands still. Instead, the dry humor, sarcasm and subtle jokes play into the tone of the rest of the film. It allows the tension to build up and the flow of the story remains relatively strong. And the technical sides of the film are well executed. Lighting, cinematography and set color all work to help create an atmosphere that matches the story. The only technical aspect of the film that is truly lacking is the CGI. The opening shot from “The Death Cure” should be taught in film schools as an example of how not to do CGI. The introduction is obviously computer generated, with the movement of a vehicle looking choppy and unrealistic. The overall scene looks fabricated. “Death Cure” had other struggles as well. A couple of scenes of uninteresting dialogue in the middle drag on too long, interrupting the movement of the story. A speech given by the relatively useless Vince, played by Barry Pepper sans sour-candy-face, is boring, pointless and trite. Vince’s attempt at motivational speaking in the final scene is worthy of at least three eye rolls. It’s not enough to ruin the whole film, but disrupts the closure that fans of the series want. Some of the unimportant dialogue seemed to be designed so younger audiences don’t get lost. The brief communication feels too informal, without the use of any specialized jargon you’d expect. While it’s a small detail, it’s enough to remove the viewer from suspended disbelief. The same adverse effect is achieved when Thomas and his comrades gun down enemy troops from a considerable distance with pistols, or when resistance leader Jorge points a revolver out the window of a truck traveling off-road and fires nonchalantly at a soldier on a train, finding his mark without any visible effort. The climax of the film is almost free of clichés. A couple of jump scares and a who-shot-who moment in the final battle lack originality. With war in the streets and the close quarters fighting in a medical experiment lab full of zombie-like flare-infected patients, the finale strays away from those worn-down mechanisms and creates a sense of mild chaos. The final act of the film is a non-stop building of tension. Fighting in the streets of the last standing city acts as background for Thomas’ personal struggle, both moral and physical. It’s possibly the strongest storytelling in the series, and it should have been the last scene of the film. Instead, we get Vince talking inspirationally about a rock. Despite the way the film has taken a different approach to the depiction of combat on a larger scale— most young adult stories will take the protagonist away from the brunt of the fight on some side mission— the film is ultimately still marketed towards teens. Anyone looking for something else will ultimately be disappointed.